A few months ago I created a couple of recipes with MAGGI, with the idea to use their Wholegrain 2minute Noodles in a way they are not typically used. The last two were received so well by you lovely foodies, that we decided we should come up with some more! I love sharing different ways to create delicious but balanced meals and the wholegrain in these noodles certainly do the trick. This is my first of two; with my dreaming of spring, I whipped up this recipe, a full flavoured Asian inspired salad. 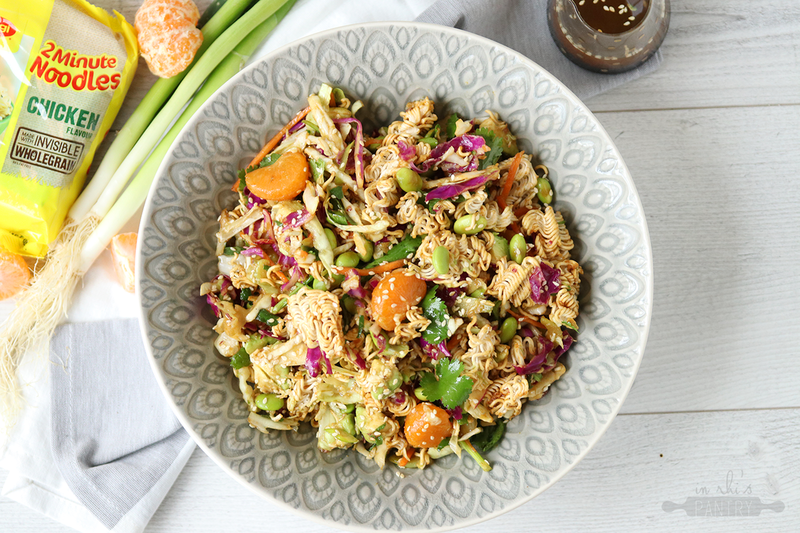 It is made up of ingredients such as edamame, mandarin, avocado and crispy 2minute Noodles all dressed in a delicious sesame hinted dressing, it’s amazing alone or accompanied by grilled chicken for a fuller meal. In a bowl, combine the slaw, edamame, mandarins and avocado. Remove the flavouring pack from the noodles, then break the dried noodles into the salad. Toss to combine. In a jar, combine the oil, sesame oil, soy sauce, vinegar and caster sugar. Stir or shake well to combine. To the salad, add the spring onion, coriander and dressing. Toss again to distribute the dressing through the salad. Transfer to a serving bowl and sprinkle with sesame seeds before serving. Serve immediately. Thanks to MAGGI for making this post possible. Competition is open to NZ residents only. To be into win you must comment below, and leave an email address to be contacted. Competition closes 30th November 2017. One voucher available over both MAGGI posts.